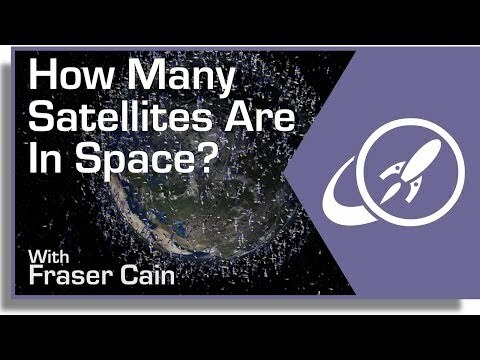 How Many Satellites are in Space? The space age began on October 4, 1957 with the launch of the first artificial satellite, Sputnik 1. This tiny spacecraft lasted only three months in orbit, finally burning up in the Earth’s atmosphere. Following in these historic footsteps, many more spacecraft have been sent into Earth’s orbit, around the Moon, the Sun, the other planets, and even out of the Solar System itself. At the time that I’m recording this video, there are 1071 operational satellites in orbit around the Earth. 50 percent of which were launched by the United States. Half of that 1071 are in Low-Earth Orbit, just a few hundred kilometers above the surface. Some of the most notable of these include the International Space Station, the Hubble Space Telescope, and many Earth observation satellites. About a twentieth are in Medium-Earth Orbit, around 20,000 kilometers up, which are generally global positioning satellites used for navigation. A small handful are in elliptical orbits, where their orbit brings them closer and further to the Earth. The rest are in geostationary orbit, at an altitude of almost 36,000 kilometers. If we could see these satellites from Earth’s surface, they would appear to hang motionless in the sky. The fact that they remain over the geographic same area means they provide the perfect platform for telecommunications, broadcast or weather observations. But there are many, many more artificial objects orbiting the Earth. In this collection of space debris we’re talking spent boosters, dead satellites, and even misplaced gloves. According to the United States Space Surveillance Network, there are more than 21,000 objects larger than 10 cm orbiting the Earth. Just a small fraction of these are operational satellites. It’s estimated there are a further 500,000 bits and pieces between 1 and 10 cm in size. Near Earth orbit is so polluted with junk that the International Space Station is often moved to avoid impact with dangerous chunks of space debris. Many of these objects are created through collisions, and some scientists are worried that future space travel might be too risky if we get too much junk orbiting the planet. We might seal ourselves inside a shield of shrieking metal moving at 29,000 km/hour. Looking outwards from our own orbit, at any time there are a handful of satellites orbiting the Moon. Right now, NASA’s Lunar Reconnaissance Orbiter and Lunar Atmosphere and Dust Environment Explorer are in lunar orbit. Further still, there’s 1 spacecraft around Mercury, 1 at Venus, 3 visiting Mars and 1 orbiting Saturn. There’s a handful of spacecraft orbiting the Sun, although they’re leading or trailing the Earth in its orbit. And a few spacecraft are on trajectories to take them out of the Solar System entirely. NASA’s Voyager spacecraft, exited the Sun’s heliosphere in 2013, and entered the interstellar medium. Starting with Sputnik’s lonely journey over 50 years ago, It’s amazing to consider just how many satellites we’ve already launched into space in just a few decades. With more launches all the time, space is becoming a busy place, with so many exciting missions to look forward to. We have written many articles about satellites for Universe Today. Here’s an article about two satellites that collided in Earth orbit, and here are some pictures of satellites. You can learn more about the US Space Surveillance Network from the United States Strategic Command website. We have also recorded a whole episode of Astronomy Cast about space junk. Listen here, Episode 82: Space Junk.